Dr. Gabriel Karns, visiting assistant professor at Ohio State University, and writer and naturalist Marcia Bonta watch Elanor Bonta collect a bee. In the category of “things we don’t usually think about while flying down the highway” is powerline right-of-ways. Occasionally we might see someone mowing that grassy area by the side of the road but at 65 miles an hour we don’t give it another thought. However, plenty of people do think about it—from energy companies to highway maintenance crews to environmentalists. The question they all want to answer is how best to maintain the right-of-way for both humans and wildlife. Is it mowing? Herbicide? Some combination? Or something else? One sunny day in the last week of June a group gathered along Route 322 south of Philipsburg, on the edge of State Game Lands 33. 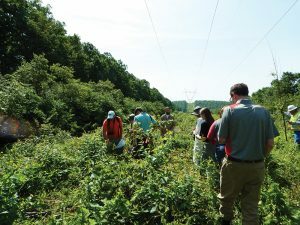 Representatives from energy providers and vegetation-management companies—First Energy, Exelon, PECO, Asplundh, Arborchem, and Dow Chemical—joined faculty, staff, and students from Ohio State University and Penn State Altoona, led by Carolyn Mahan, professor of biology and environmental studies at Altoona, to take measure of how different treatment approaches to maintaining right-of-way areas have impacted local wildlife. Also in attendance were representatives from the Pennsylvania Game Commission whose land this particular right-of-way crosses. The research approach includes six different ways to manage a right-of-way: (1) hand-cutting, with no mowing or herbicide; (2) straight mowing (the most traditional method); (3) mowing followed by herbicide; (4) a low amount of herbicide applied to the foliage of “noncompatible” vegetation ; (5) a high volume of herbicide; and (6) basal herbicide application, where “you wouldn’t herbicide anything but trees with a very selective application to the woody stem,” says Mahan. “All of these have been used by energy companies.” The right-of-way at State Game Lands 33 has been divided into six sections, each receiving one of the treatment methods. 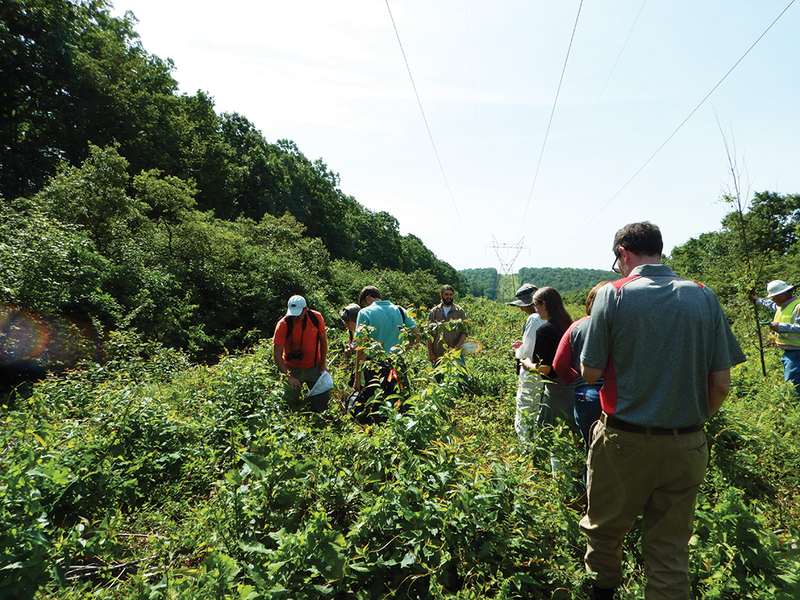 Researchers and funders spread out to check on vegetation treatment success. The annual field day gives the researchers and the companies a good idea of how each approach is working. Not only do the attendees get a good look at the six different treatments, but they also take part in the monthly bee collection. 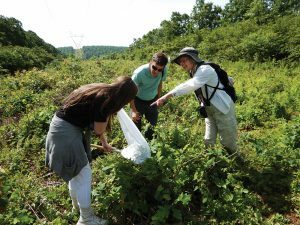 Pollinators are a very important part of our ecosystem and their recent die-off is a matter of great concern for scientists; Penn State University even has a Center for Pollinator Research that focuses research on these important species. Collecting bees on the right-of-way, twice a day (a total of four hours), once a month over four months, “does not deplete the population and assures proper identification of the bees to the species level. All bees are curated at Penn State’s Frost Entomological Museum,” Mahan assures. Ivy Leaf is published biannually by the Office Strategic Communications. Copyright @2017. Penn State Altoona. All Rights Reserved.